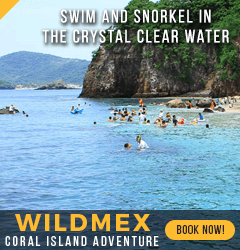 Want to snorkel in Sayulita? The main beach of Sayulita is better suited for surfers rather than snorkelers but there are some great snorkel locations within walking distance from the main beach and near Sayulita. It is advisable to bring your own snorkeling equipment to Sayulita Mexico, however limited rentals are available at local shops. If you would rather take a snorkeling excursion and see some of the area's best snorkeling locations, see our Tours and Adventures page. (snorkeling equipment is provided on tours). If you take an organized tour or snorkeling trip with one of the local Mexican boat captains (see Fishing), usually the equipment is provided for you. Here are a few excellent places to snorkel and explore under the sea with a variety of fish and sea life to observe. Don't forget to bring your under water camera! Las Marietas Islands, with stunning rock formations and coves, is one of the bay's most popular snorkeling destinations. Besides swimming amongst a variety of colourful tropical fish, you may come across some octopus, unique Blow Fish, spotted rays and possibly Sea Horses! The Mariettas Islands is also home to 100 different species of tropical birds as well, so if snorkeling isn't your thing be sure to bring your binoculars! At the Mariettas Islands snorkelers of all ages can incredibly blue waters, ocean breezes and the abundant nature that the these islands offer just a short boat ride away from Sayulita. See our Tours and Adventures page for tour operators. Punta Los Arcos is a quick walk from Sayulita's main beach, just follow the road around the bay to the front of Hotel Villa Amor. Between the hotel entrance and the road to the cemetery are plenty of entry points to wade/swim out and explore the rocks and aquatic life just beneath the surface. The waves are gentle here and you can spend hours observing the variety of fish and sea creatures right here in the Sayulita bay. Continue past the cemetery on to Playa de Los Muertos, which is very popular with Mexican families and a safe swimming beach. Huge rocks protect it on both sides. Las Cargadas is the tiny beach past the rocks to the south. From the beach look to the south and you will see three or four rock islands. All of these provide for great Sayulita snorkel adventures. Starting at the cemetery, its your second right turn. Through town, follow Niños Heroes until it enters the jungle and make the first left turn. This is an uphill 40-minute walk. If the waves are calm enough, the point on the south end of the beach offers chances to see much larger fish than in the Sayulita bay.